"We work with businesses to collect things they don't want, that we think have value in the creative process, and we use those materials to make our reCREATIONS. These are not mass produced kits, but rather, one of a kind activites packaged up for your creative enjoyment. Our kits are meant to help you explore a hands-on, tactile art experience, as a family." Please leave a comment by Tuesday at 9pm EST. The random winner will be announced on Wednesday morning. Good luck! What a fabulous idea! I feel a little less like a hoarder now... I keep little leftover crafty bits. I think I'll make some little stocking stuffer kits for my short people. Great example of turning trash to treasure! Endelss possibilities! the horse & bird nest kits look fabulous ! What a great idea- the nest and horse are my favorites! My little guy loves to do "projects" like this! He would go crazy over these kits! pretty cool. we love recycled crafts! My oldest son would love these kits. Thanks for the giveaway. Making stuff by recycling material always makes me feel as if I can give myself a pat on the shoulder - I like that feeling (it's rare enough, otherwise..:-))! Wonderful giveaway! Fantastic...always looking for new ways to use toilet paper rolls with the kids!! Your blog is fun and inspiring reading. The horse is my favorite! Thanks for the creative giveaway! Neat ideas! My daughter was loving making the advent calendar toilet paper tubes today! Love the ReCREATE Blog and the whole concept of the business.Thanks for having the give away. awesome! i clearly remember an amazing bin of cast-offs at the Children's Museum of Boston when I was 10/11ish...i think it shaped me forever. nowadays, my five year old creates most of his art from the junk drawer and recycling! would love this kit for him for xmas!!! Really cool. This is something my kids would really dig. Oh I've been eyeing those! 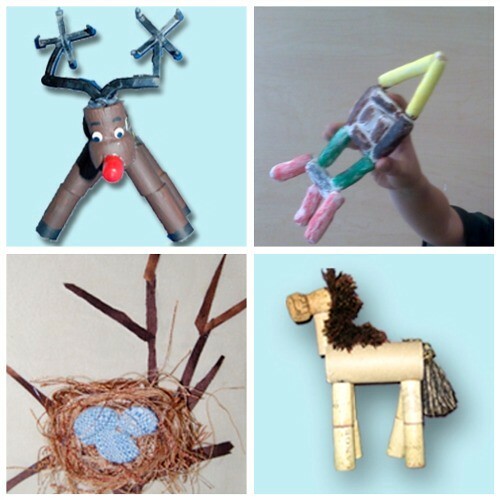 I was thinking of making my kids' friends my own recreated craft kits for Christmas, but time has not allowed. :( I'd love one for our house and for inspiration! I love this idea. I'm trying to teach our kids the same concept.